As you probably already know, or will eventually find out, good financial health is not all about the numbers. Discipline, patience, smart decisions and a marketable skill set (among others) all weigh heavily on your finances. There is plenty you can do to change any of these variables to make your finances stronger, but sometimes just taking a long, hard look at the numbers can motivate you to change habits or actions that you have been taking for far too long. Do you know how much you pay every month in interest alone? A few years ago, when I really started to take an interest in personal finance and become more aware of intricacies and specifics related to money matters, I did something that ended up being very eye-opening. Though it only took a few minutes, it changed the way I look at money. It also made me realize how much I was giving away without a second thought. The sad thing is, you may be doing the very same thing I was, so I would like to show you how to how to find out how much you are paying in interest every month. Maybe it will surprise, shock, or motivate you enough to get on the wagon and try to keep this money for yourself. Gather your credit card, loan, and mortgage statements. Include any other loans you pay interest on. Every statement (yes, even online statements) should clearly state the interest paid for the current billing period. If not, there are other ways to find these numbers (like a phone call or an examination of your contract). *Important Note* You may be paying two (or even three) separate interest rates on credit cards. Almost all cards have a different rate for cash withdrawals or advances, you may also be paying a special “introductory” rate on a percentage of your balance. All of the interest on these balances count toward the total, so if there is a number next to them, include it in your calculations. You likely have a few different numbers in front of you. If you add them together, you effectively have what you pay in interest per month. These numbers change positively or negatively based on your activity. 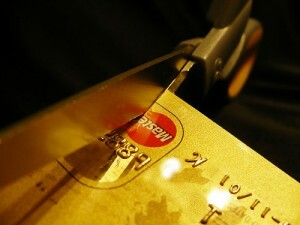 (If you are still using credit cards, or add to loan amounts, they will increase). But at least now you have a pretty good idea of how much you are paying in interest alone. Okay, maybe you were pretty aware of how much you pay every month and these numbers were not that daunting to you. But I would like you to take that interest number and multiply it by 12. Does that one look a bit scarier to you? It definitely did to me. That is what you pay annually in interest. Just imagine what you could do with it if you were debt free! While it is true that personal finance is not “all about the numbers”, sometimes it helps to know the numbers to give you that kick in the pants you have needed to take action. If you actually participated in this exercise, were you surprised by the results? Did it show you something you were unaware of? If so, does it motivate you to make the changes necessary to STOP paying the interest by getting out of debt? I hope it does, and I hope you are not crying. How much Interest am I Paying on Debt each Month? How to Figure it out. | Debt Free Adventure! Awesome Matt. Did you know that I wrote a post urging people to do the exact same thing? Figuring out exactly how much of your hard earned dollars are going to other people… then tracking it and watching it go down every month is a HUGE motivator and is often the first thing I tell people to sit down and do. Why? Because it is the best thing I have found to motivate them to get rid of their own debt! I did not realize that! Well, it is still an eye opening experience for some. Well done Matt. The realization on how much hard earned money people overpay every months in interest and knowing knowing how these expenses can be cut off can help people change their mind, open their eyes in give them motivation to cover their debt faster. Next post: How Much (If Anything) are you Willing to Pay for Hulu?